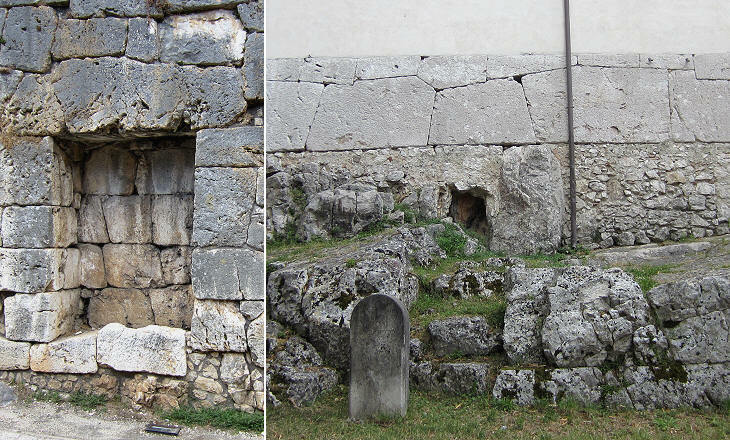 Ferdinand Gregorovius, a German historian best known for his studies on medieval Rome, spent the summer of 1858 at Genazzano; from there he decided to visit the towns which are located at the foot of the Ernici Mountains: Anagni, Ferentino, Alatri and Veroli, to see their ancient walls and medieval monuments. Gregorovius described this journey in Aus den Bergen der Herniker, an account written for a German paper (you can read the English translation by Dorothea Roberts in Bill Thayer's Web Site). 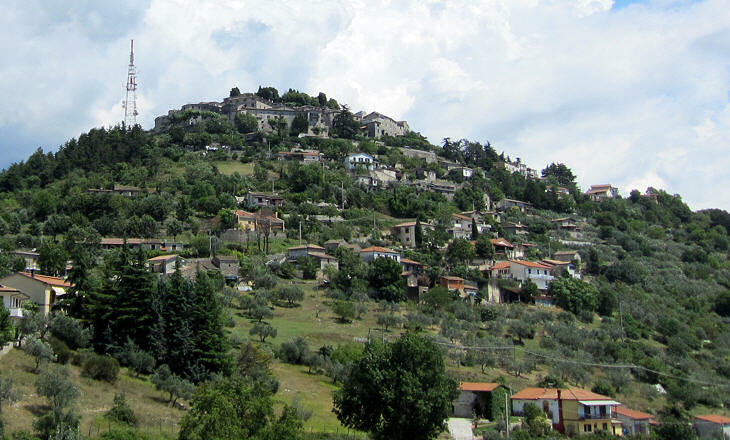 After having visited Anagni and Ferentino, Gregorovius left the latter early in the morning to reach Alatri; he soon noticed Fumone, a small group of grey buildings at the top of an isolated mountain to the left of the road. The apparently negligible village excited the imagination of the German writer who had in-depth knowledge of a tragic event which had taken place there. This event was related to two popes whom Dante mentioned in The Divine Comedy: Pope Celestine V and his successor Pope Boniface VIII. The former was placed by Dante in the "Vestibule" of Hell among the Uncommitted (those who took no stand) for having renounced the papal throne (Che fece per viltade il gran rifiuto - Who by his cowardice made the great refusal). Pope Boniface VIII was placed in Hell among the simoniacs, those who sell pardons and indulgences for their own profit, but he was also charged with having exerted unfair pressure to convince Celestine. In his act of abdication signed at Naples Celestine, a former Benedictine monk, explained that the decision was due to his desire to return to a simple life of penance, but Boniface, wary that his predecessor could change his mind, ordered his arrest and confined him at Fumone where Celestine died a few months later. Today the location has a brighter appearance than it had in 1858 and some inhabitants of the towns in the valley have built their second homes there. 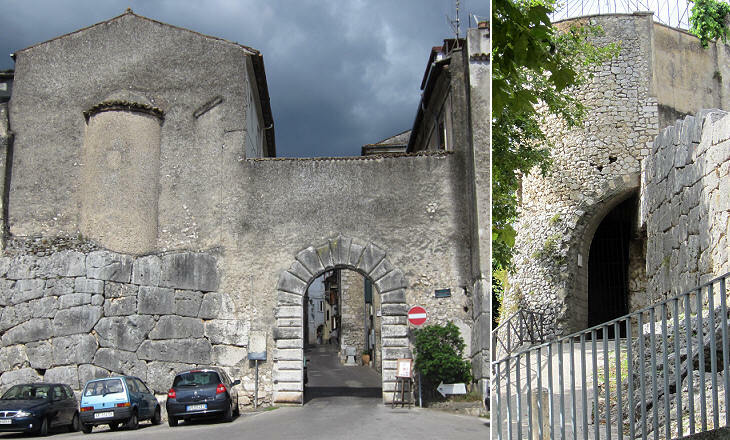 Similar to Ferentino, Segni and other towns of the region, ancient Alatri was surrounded by walls built by placing big boulders one next to the other; sections of the ancient walls can still be seen in the western and south-eastern sides of the town. 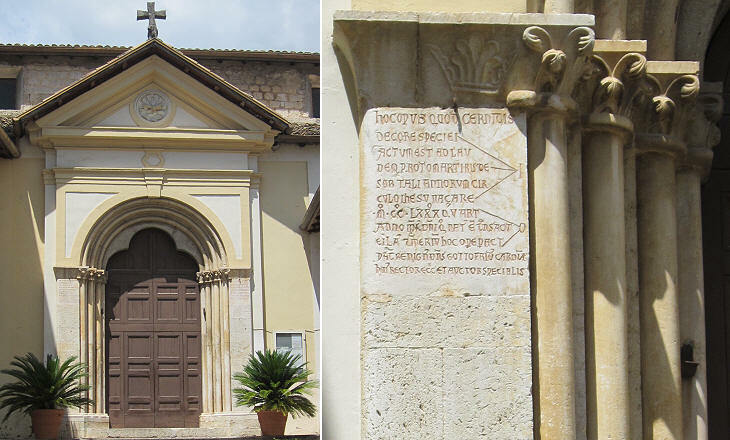 The main objective of Gregorovius' visit to Alatri was to see the Acropolis (upper town) which he knew had been restored and freed of later additions prior to a visit made by Pope Gregory XVI in 1843. The Acropolis of Alatri is not just the part of the town built on higher ground, but a veritable monument by itself because it is mainly man-made with huge walls supporting a large artificial terrace. Gregorovius was highly impressed by the size of the boulders which made up the walls and he admired the preciseness by which they were arranged which resulted in a perfectly smooth surface. 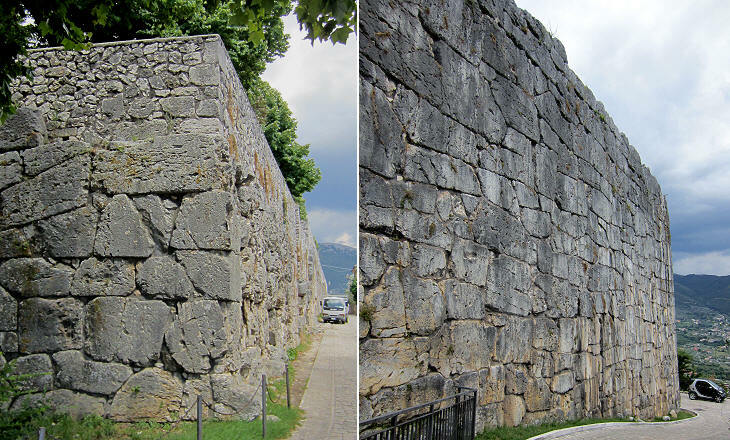 These walls are called cyclopean because it was thought that only giants could have lifted their boulders; according to tradition Alatri was founded by Saturn, the god the Romans associated with a mythical Golden Age; this element led to the popular belief that the walls of the Acropolis were built at a very ancient time. Archaeologists have come to very different conclusions and nowadays the walls are dated IVth century BC and possibly later. 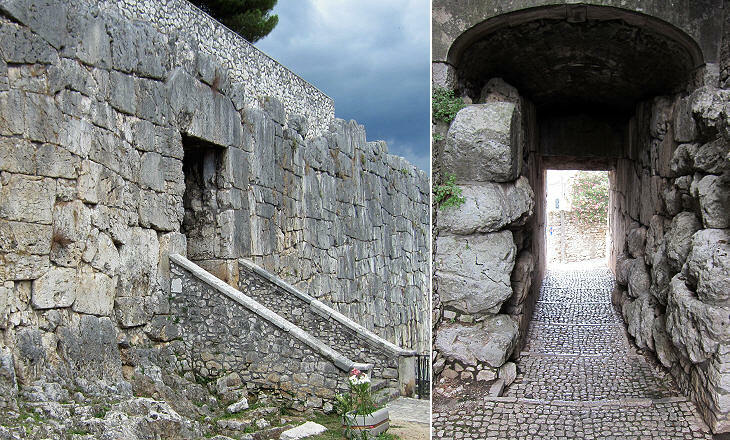 According to some sources the positioning of the Acropolis and of the ancient gates of Alatri was established on the basis of astronomical measurements; today this opinion receives a lot of attention owing to a general revival of interest for occultism and mysteries. The Acropolis however was basically a fortress and a holy site and because of this it was accessed only through two gates, of which only one was large enough to allow the passage of carriages. The lintel of the second gate was decorated with three converging phalli (which were more visible before a recent cleaning of the walls); these symbols had an apotropaic function i.e. they averted bad luck and they did not have any sexual connotation (for phalli which maybe had this connotation see a page on Delos). Gregorovius wrote in his account that he was more impressed by the Acropolis of Alatri than by the Colosseum. The phalli on the small gate are not the only remaining sign of the ancient beliefs; three niches near the main gate probably housed statues of local deities which, similar to the phalli, had an apotropaic power. The terrace of the Acropolis has a roughly rectangular shape (pentagonal for the supporters of astronomical theories); an ancient building, probably an altar dedicated to Saturn, stood at its centre; it was covered by the construction of the town's cathedral, but some of its walls have been made visible. The Hernici were an ancient people who lived in a mountainous region between the valleys of the Sacco and Liri rivers; the mountains named after the Hernici have peaks of more than 6,000 ft and they constitute a barrier with no routes through it; at the time of Gregorovius' visit to Alatri the Ernici Mountains marked the border between the Papal State and the Kingdom of Naples; even today one can detect differences in the costumes and in the spoken language of the inhabitants of the two valleys. 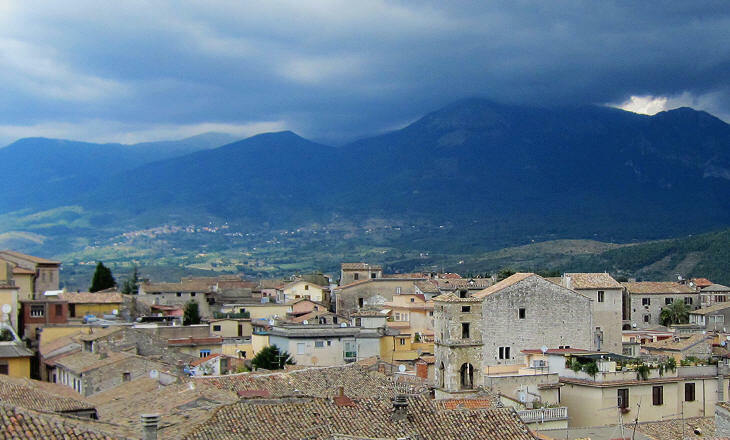 Gregorovius found Alatri a very rich town when compared to Ferentino. 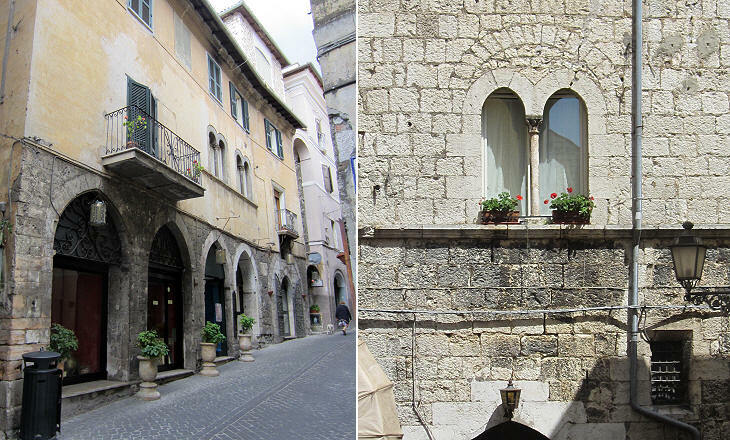 The wealth of Alatri came from wool and felt-hat factories. The 1863 map which illustrates the itineraries of this section in the introductory page clearly indicates that Alatri was at that time the most important town in the area (today Frosinone is more important). S. Maria Maggiore is definitely the most interesting church of Alatri; it was built in the XIIth century and it was enlarged in the following one; in the XIVth century its plain Romanesque façade was embellished by a Gothic rose window which has a very unusual design, because the central wheel spokes which characterize most rose windows here are inscribed within a square. 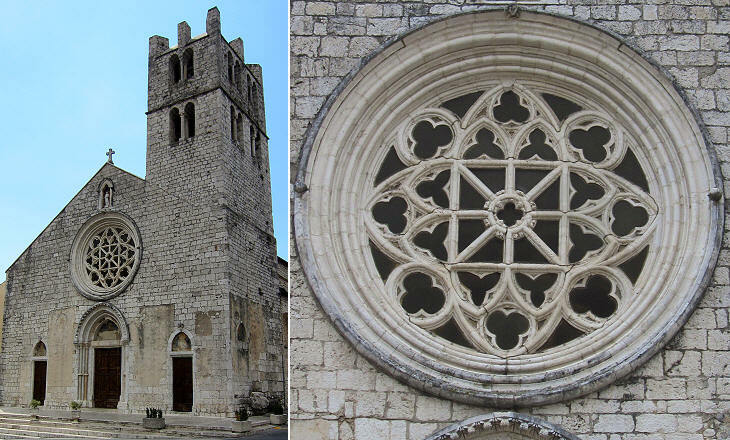 There are local experts who suggest the square has a symbolic meaning, but in Livre de Portraiture, a XIIIth century repertory of architectural patterns by Villard de Honnecourt, there is a drawing of a rose window at Lausanne in Switzerland (external link) which is very similar to that of S. Maria Maggiore. 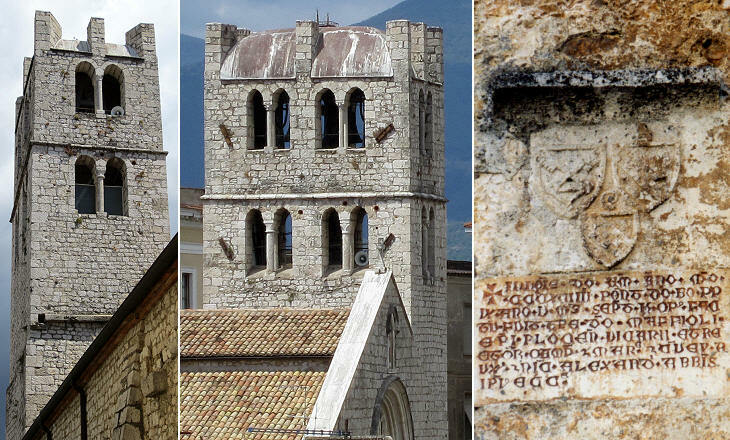 According to an inscription the bell tower was built in 1394; it was taller than it is today and it was topped by a pyramidal spire; in 1654 an earthquake caused the partial collapse of the building. Those who built S. Maria Maggiore probably had a penchant for original designs because the bell tower has a very rare rectangular layout. S. Stefano was built in the XIIIth century, but the portal is the only remaining part of the original church; it retains a Latin inscription in Leonine verses, a type of poetry based on rhymes which was unknown to the ancient Romans and which was developed during the Middle Ages by a monk called Leonius. The inscription celebrates Cardinal Gottifredo da Alatri, who played a major role during the confrontation between the Roman Church and the German Emperors of the House of Swabia. 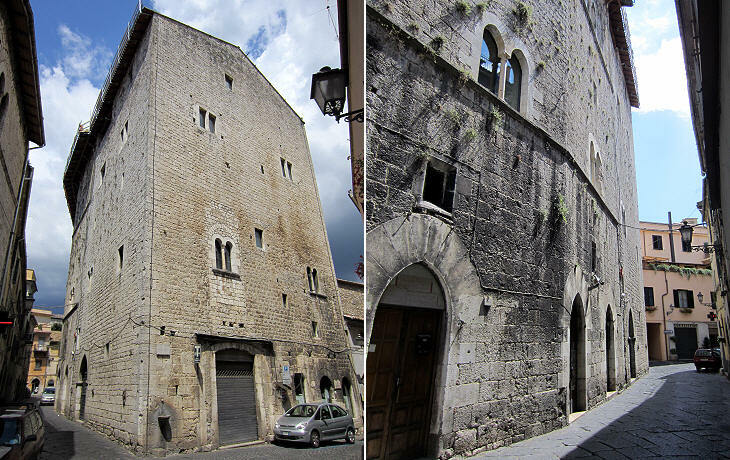 Cardinal Gottifredo was appointed podestà (a sort of governor) of Alatri and he resided in a palace which he built by joining together two existing towers; the building shows how Cardinal Gottifredo gave more importance to security than to aesthetic aspects; although he belonged to a local powerful family he feared being attacked by his own fellow citizens. He knew he lived in a ruthless and treacherous time and he took precautions; as a matter of fact, although his precise year of birth is not known, Cardinal Gottifredo probably managed to reach the age of ninety and he succumbed only to the plague which struck Alatri in 1287. Similar to other towns of the region Alatri was damaged during Guerra di Campagna the war which Pope Paul IV waged on Spain; Don Fernando Alvarez de Toledo, 3rd Duke of Alba, governor of the Spanish possessions in Italy invaded the Papal State in 1556 and conquered several towns including Alatri. 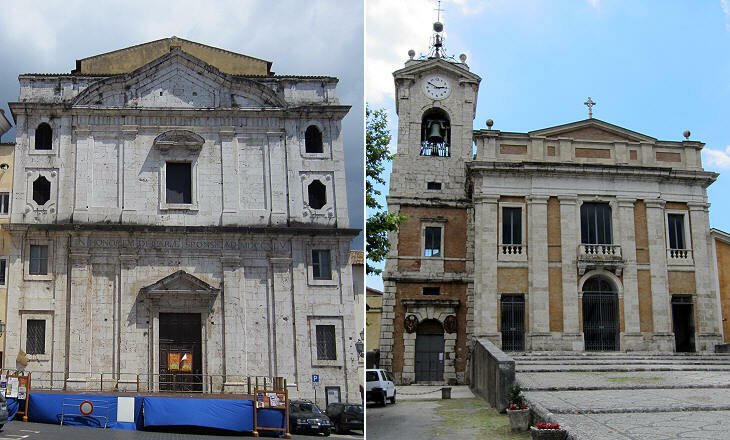 During the XVIIIth century the development of textile industries in the district of Alatri brought some wealth to the town; S. Maria dei Padri Scolopi and the new cathedral are evidence of this positive economic phase; the former vaguely resembles Oratorio dei Filippini in the design of the upper part of the façade, the latter recalls S. Giovanni in Laterano. 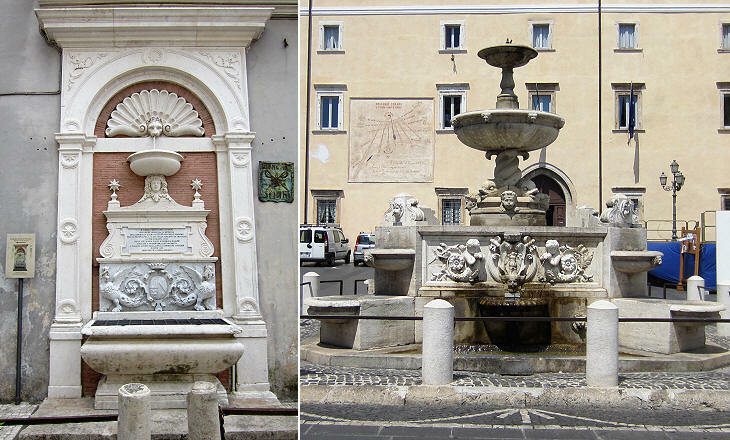 In his account Gregorovius described how he spent some time watching women pulling up buckets of water from wells; a dreary and tiresome activity which he would not have seen had he visited Alatri just a few years later, because in 1869 an aqueduct and several fountains were built in the town; the main fountain was dedicated to Pope Pius IX, the ruling pope and a lengthy inscription on another fountain celebrated his munificence; it is among the last of this kind because in the following year the Papal State came to an end and Alatri was annexed to the Kingdom of Italy. 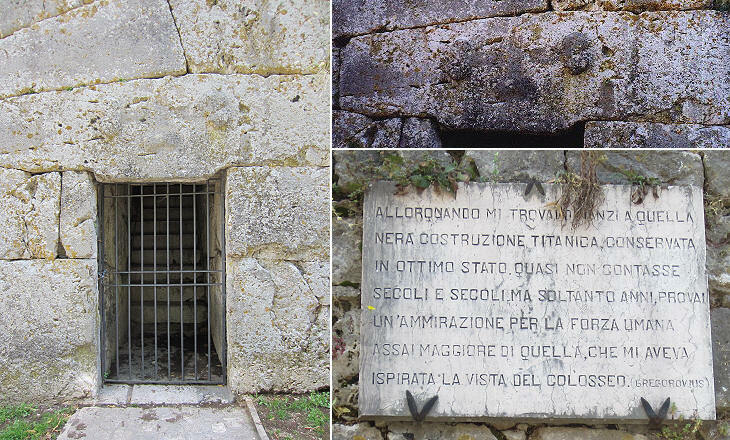 Gregorovius ended his account by describing a visit he made to Certosa di Trisulti, a Carthusian monastery where he spent a night and to Veroli, a town which is covered in another section of this website. Previous page in this walk: Ferentino; next pages in this walk: Anticoli/Fiuggi and Piglio and Acuto.